In the face of apocalypse, the Garou need every power they can muster against the armies of corruption and decay. 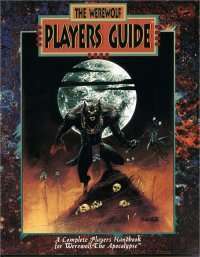 The Werewolf Players Guide includes new powers for the battle, from powerful Gifts to amazing fetishes. Herein are detailed the strengths of the Garou - and their weaknesses. Discover the different camps within the 13 tribes who all vie for their own visions of the world. Sit in on a moot, from the Opening Howl to the predawn Revel. Witness the Litany enforced by the mighty Silver Pack. Uncover the secrets of the other werefolk, hiding throughout the world and nursing their ancient hate. The Werewolf Players Guide will enrich any Werewolf chronicle. New character creation options, including Merits & Flaws, Personality Archetypes and new Gifts. Expanded rules for Rage and combat, including Klaive dueling and the Garou martial art of Kailindo. The other shapeshifters of the world, from the uncanny Bastet catfolk to the bizarre Anasazi werespiders.